Although I am all for fun art projects, there are times when less mess is ideal. 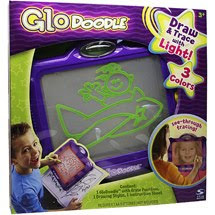 That is why I was thrilled to learn that Spin Master, the company who brings us Aquadoodle, has introduced a new drawing toy for fall 2009 called the GloDoodle. This toy is used similarly to a standard magnetic drawing toy, except it has a much higher coolness factor. Retailing at a reasonable $19.99, this is a toy that you should consider putting on your gift list this year. 1) I like that this toy is lightweight. It is not clumsy to handle, even for my toddlers. 2) The self-storing stylus is just long enough for a left-hander to use. One of our twins is left-handed and he can use the toy with no problems. 3) This toy is very user-friendly. Although it is recommended for children aged 4+, our toddlers are able to doodle with it. There is one large Magic Erase button to press to clear the screen and there is one switch on the side that slides to change between red, green, or yellow neon light and to turn the GloDoodle off. 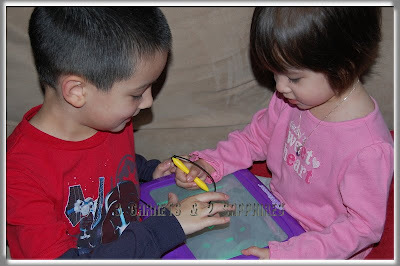 4) My children think it is fun to be able to draw with their fingers because that is not something they can do with their magnetic drawing boards. I do have to say that, since this drawing effect is a result of pressure, using the stylus gives much more precision. For example, when my children try to create a hand print on the GloDoodle, the hand print does show up, but there are also residual marks around the hand shapes. 5) One of the coolest features of the GloDoodle is that the drawing area is transparent. 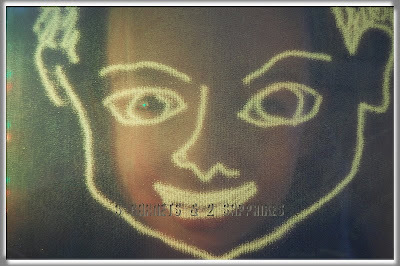 This allows the user to trace pictures from books, magazines, and even faces. There are many tracing cards that you can print free of charge for your child at GloDoodle.com, but you can pretty much use any printable available online for tracing. To learn more about the GloDoodle, visit http://www.glodoodle.com/. You can find this toy locally and online at major toy retailers, such as Toys R Us, Amazon.com, Walmart, and Target. Thank you to SpinMaster for providing us with both a review product and a contest prize free of charge. One lucky reader will receive a GloDoodle of their very own. Pop over to SpinMaster.com and click on "Products". Then leave a comment telling me what toy you see that would make a great gift for a child you know. You MUST do this to be eligible to win this contest. 4) For 10 extra entries, blog about this contest linking back to this post AND GloDoodle.com . Then come back here and leave TEN separate comments with the link to your blog post.